Best Waterless Shampoo For Dogs Review: Top-5 in April 2019! As with other aspects of dog care, there are a lot of options for grooming your pooch. You can opt for a full professional clean up or groom your dog all by yourself in your home. In between full baths, another option you can explore to clean up your dog is to use a waterless shampoo. A waterless shampoo does not require you to use water before you can use them to clean up your dog. You simply apply the shampoo to your dog’s coat and rub it in to spread. This makes it a perfect choice for cleaning dogs that don’t like water or the idea of getting wet to reduce the frequency of a full bath. While it doesn’t substitute for a full bath, having a waterless shampoo around will come in handy to keep your dog clean and fresh before a full grooming can be scheduled. Waterless shampoos are perfect for taking care of your dogs in between baths or in cases when a full body bath isn’t possible like after a surgery, in cold weather and so on or for spot cleaning minor stains. Although they a dry shampoo does not take the place of a full bath, it is still important that you are making use of the best in cleaning up dog to keep them clean neat and smelling good at all times. Here are some of the best ones you can try out. For dogs suffering from scratching and flaking as a result of skin conditions like seborrhea dermatitis and similar disorders, this special Anti-itch shampoo from Davis is a suitable long-lasting and fast-acting solution you might want to go for. Formulated specially for dogs puppies, cats and for kittens, this shampoo contains 1% Pramoxine hydrochloride with colloidal oatmeal and moisture-rich emollients which are known to promote a healthy and shiny coat. In addition to the earlier listed ones, the ingredients contained in this product includes: Aloe Vera, esters of EGMS fatty acids, ammonium Laureth sulfate, ethanol, propylene, glycol, and PH adjuster, it also contains cosmetic grade dye for coloring and cosmetic grade preservatives all which are safe for use and beneficial on your dog’s coat. Davis pramoxine is a powerful anti-itch shampoo suitable for combating flaking and scratching in dogs of all breeds and sizes. It promises an overall healthier coat and contains ingredients that might be effective in treating symptoms of skin conditions like seborrhea dermatitis and others like it. It is easy to use, you simply apply to your dog’s body and it lathers almost instantly without the need for prior rinsing. Making grooming your canine less of a task. The shampoo rinses out quite rapidly as well. It also has a pleasant smell that will leave your dog’s coat smelling very nice for a long time after each wash. It is mild, which allows you to use this shampoo quite frequently without putting your pups at risk. After applying the shampoo you have to wait for 5 to 10 minute for it to sink in, this might be too much of a wait for some people. Can I use this product for a puppy? 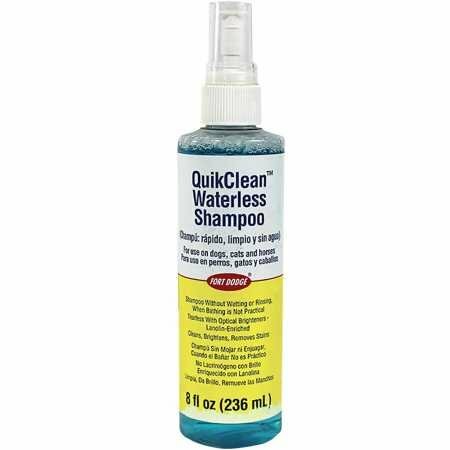 QuikClean Waterless shampoo is suitable for quick and convenient clean up of your dog without having to wash or rinse its body with chemicals. It is formulated to be PH balanced which makes it quite mild on the skin. It Is also free from harsh chemicals and does not leave any irritating residue after your pooch is cleaned up. This waterless shampoo contains optical brighteners and conditioners for maintaining a perfect coat in dogs of all ages. It is also rich in lanolin; the same substance which protects the skin and wool of sheep from harsh environmental conditions. It is completely free from harmful harsh chemicals and is mild on the skin for continuous use with minimal or no risk of side effects at all. This 100% natural formula is coconut derived along with other natural highly nourishing ingredients. While this waterless shampoo might not be suitable for a full bath, it can still be used for on-the-go cleaning anytime anywhere for extending the time between full baths and for taking care of smelly or active dogs or those who don’t like getting wet. This waterless no-rinse shampoo can be used for cleaning your dog, as a conditioner and can also help to deodorize your dog. This mild coconut based formula is fast and easy to use and does not require any rinsing with water at all whether before or after application. It also does a great job at getting rid of odors on your dog as well by actually removing the bacteria causing the odor rather than just masking the fragrance. 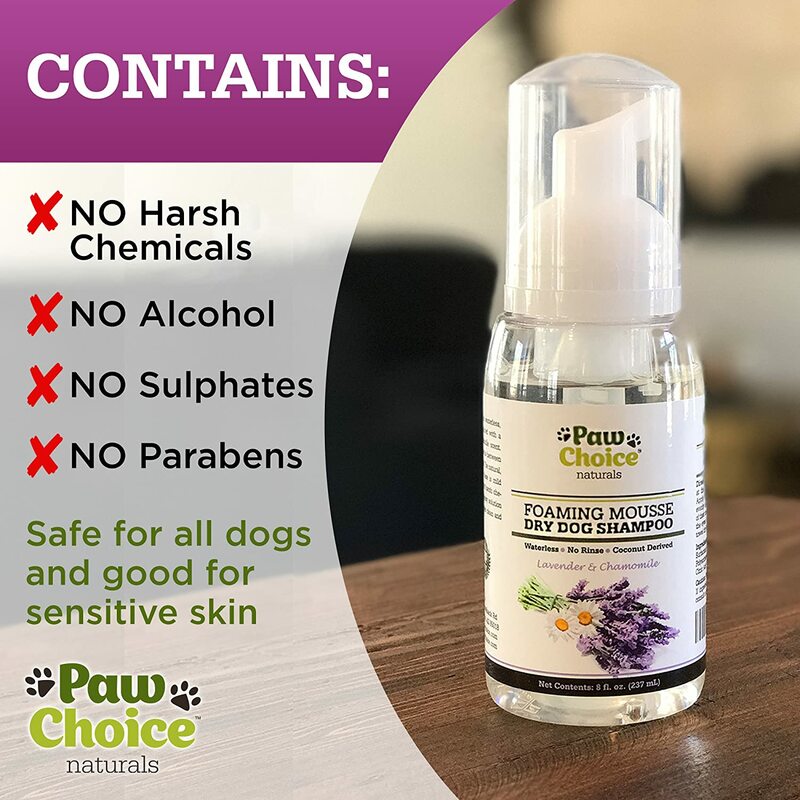 It is free from harsh chemicals, parabens or alcohol, and helps to condition your dog’s skin and coat and it also freshens up your dog thanks to its Chamomile and Lavender scent. Does this shampoo clean white paws? If there is actually dirt then it won’t remove it. Think of it like our dry shampoo, it buys you time in between baths. I have 2 Rottweilers that are 1 year old. How many bottles do I need to purchase to clean them? 1 bottle should be fine to start with for both dogs. A little does go a long way. I recommend smoothing the foam out on the surface of the coat as much as possible before massaging it in. This will allow you to cover more area while using less. This simple spray and wipe cleaning formula might be an ideal choice for keeping your dog clean and fresh without having to rinse with water in between washes. It helps to get rid of the stinky dog odor and is a recommended alternative to regular washing which you might find time-consuming and messy especially if you have a pooch that doesn’t like water. Vet recommended waterless shampoo has a light but pleasing apple smell, but it doesn’t just mask the odor, it acts as an active cleaning agent, getting deep into the hair and cleaning it thoroughly. It is mild and works for dogs of every hair type even for those with sensitive skin as well. Vet recommended waterless spray shampoo is a hypoallergenic spot cleaner, free from alcohol, or artificial dyes which may discolor your dog’s coat. 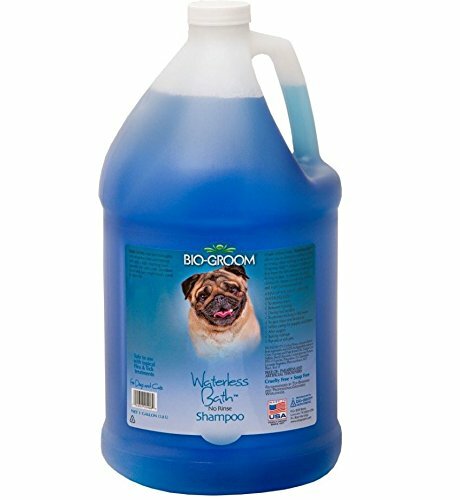 Does this product leave a film on the dog after spraying as some products do? Is this shampoo PH balanced? It is pH balanced for dogs at 6.5 – 7.0 which is within the safe range of 5.5 – 7.5 recommended for dogs. 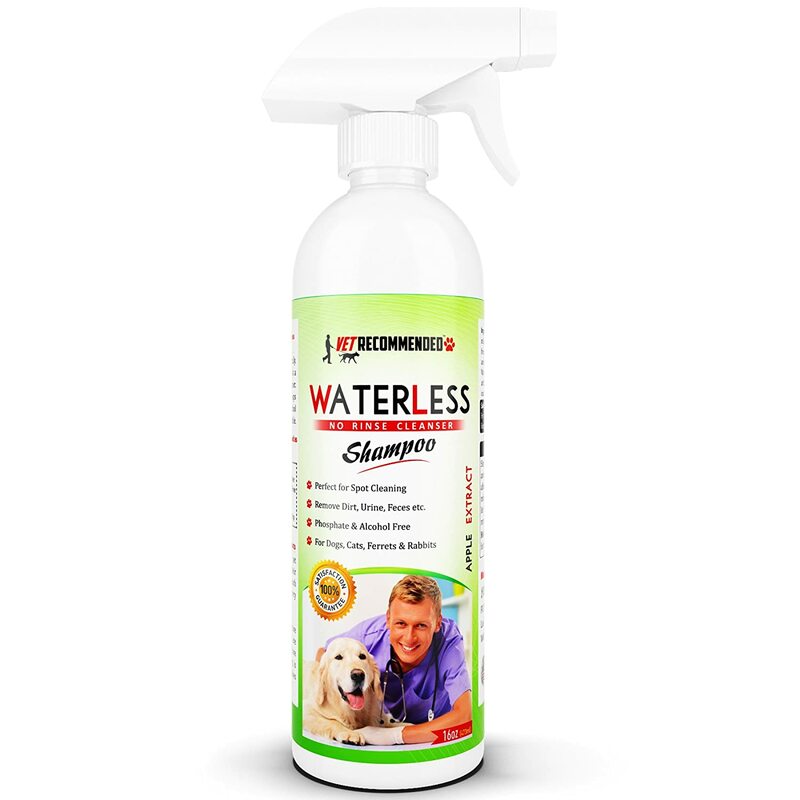 This easy to use waterless shampoo is ideal for cleaning up your dog in a variety of scenarios where rinsing or wetting won’t just cut it. Not only does this shampoo gently gets rid of stains, but it also contains some optical brighteners and helps to highlight your dog’s natural colors. This PH balanced, tearless formula is a recommended choice for cleaning dogs of every coat type in situations where a regular bath isn’t possible such as during bad weather, after surgery, or for senior dogs among other use cases. It is suitable for gentle cleaning and for removing stains without a need to rinse. It is tearless, contains no alcohol, and is PH balanced suitable for spot cleaning and can also help to deodorize your pooch in between baths. How often can I use this shampoo to clean my dog? What are the ingredients in this shampoo? Like almost everything you get for your dog choosing the best is most times a combination of various factors rather. Which means we cannot simply say a product is the best on its own. Asides personal preferences both on your part and even more importantly of your dog (since you also have to choose something that your dog loves as well), there are a number of factors ranging from something as seemingly unimportant as the spray bottle to the product’s composition, effectiveness and so on. Generally, the best waterless shampoo should be convenient to use, which is why shampoos with spray bottles are the favorite for many people. But more importantly, in addition to being effective and cleaning your dog’s coat, the best shampoo for your dog would be one that doesn’t trigger any irritation and is suitable for your dog’s skin and coat type. You might want to pick a hypoallergenic brand if possible and of course products that offer extra features like deodorizing properties, skin conditioning, and flea treatments are also top choices to consider as well. Generally, a natural waterless shampoo with no harsh chemicals should be your choice of shampoo to use for your dog. Is there a dry shampoo for dogs? Is dry shampoo safe for dogs? If you are considering the idea of buying a waterless shampoo for your dog, one of the questions you will probably want answers to is whether it is safe to use a dry shampoo for your dog. To answer your question, it is safe as long as you are using a good quality product and you are making use of it properly. Generally, how safe the dry shampoo is, depends largely on the brand of product you are using and whether the ingredients it contains does not cause irritation for your dog. Additionally, in terms of proper use of dry shampoo, you should always bear in mind that using dry shampoo isn’t in any way a replacement for a proper bath which. Doing this will expose your dog to increased buildup of dirt which might cause irritation and even sores in the long run. What is the best shampoo for puppies? Generally, for the first 2 to 3 months of your puppies’ life, you have no business trying to clean them up with a shampoo. Usually, the mother will clean them up by licking them whenever there is a need for it. When its finally time to start offering a helping hand, your choice of shampoo is very important. A puppy requires special treatment and attention and of course a different type of shampoo compared to an adult dog. A puppy’s skin is softer and usually will be quite sensitive, which is why your choice of shampoo is very important. Today it is possible to find shampoos for both adult and puppy dogs, always make sure you check to confirm if the shampoo you are buying is suitable for young dogs. As with adults, the dog shampoo products will be one with natural ingredients free from harsh chemicals and most importantly that has been formulated to put into consideration puppies with sensitive skins. Shampoos with organic ingredients such as pro pet waterless shampoo is a great choice for your beloved pooch.